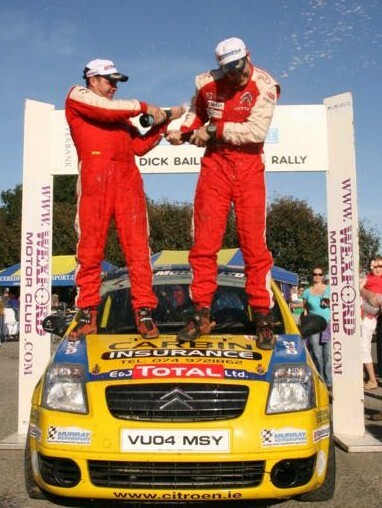 As a co driver, your celebration time is usually short lived because you still have work to do. After you hand in your final time card, you're still responsible for a couple of things. The provisional results will be posted (see the Supplementary Regulations for when and where), and you will have a limited time to check the results and to "protest" if something appears to be wrong. There are strictly enforced procedures that you must follow if you decide to protest a rally result, and you will be expected to pay a fee (that will be refunded if you are deemed to be correct). Eventually, the rally results will be declared "final" and you can relax. If you are lucky enough to have won an award, part of the job of being a co driver is to let your driver take the credit. Smile graciously, accept the applause, and remember that no matter how unfair it may seem, the public thinks that the fastest driver wins every rally or race, and has no clue about what you did. Every driver I have co driven for understands the importance of a good co driver, but like it or not, the driver will (and should) take most of the credit.